In the year 1818, the Township of Chinguacousy (an Indian word for “pinery”) was first surveyed out of the primitive forest. 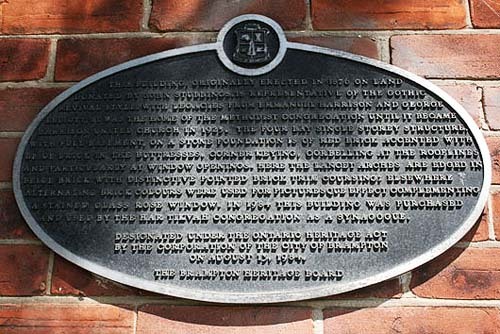 The Township was settled by United Empire Loyalists who came from the United States after the War of 1812-14, as well as immigrants from the British Isles. By 1819, nearly all of the Township of Chinguacousy was settled. This building was originally called Harrison United Church, and was named after one of the earliest settlers, Emmanuel Harrison, who arrived in December 1820, purchased a part of lot 9, fifth concession, and built a log cabin. Before they were able to build a church, the services were held in the open around the cheerful flames of a fire, on the land which housed Harrisonï’s own log home. On May 2, 1840, Emmanuel Harrison Sr. deeded one acre of land for a burying ground and the erection of a Wesleyan Methodist Church. There was a gallery for the choir built over t he front door and the pulpit was at the centre of the opposite end and was of the high closed-in type, common to that day and frequently called “the swallow’s nest”. The men sat on one side of the church during the services and the ladies on the other, although newly married couples were permitted to sit together for their first three Sundays. This church was used until the present building was built in 1875-76. The old building was then used for concerts and tea-meetings until it was torn down in 1880. The present building is located across the road from the original site (and you will note that the original cemetery is still on the west side of Torbram). The original design of the Church had a balcony over the west end and a two-story section on the east. A circular stained-glass window was installed above the vestibule which originally had a flat roof with a steeple-shaped tower on each front corner. In 1925, Harrison Methodist Church became Harrison United Church, following Church Union. In 1947, the building was renovated to raise the auditorium 35 inches and the lower level was dug down three feet. 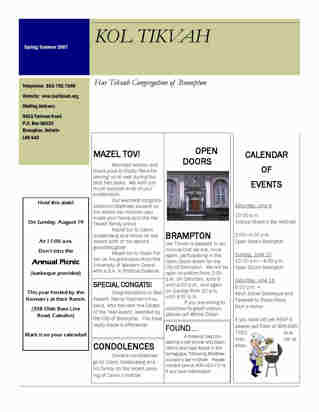 In 1983, Har Tikvah Congregation of Brampton purchased the church and converted it into a synagogue, where it continues to serve the Jewish community of Brampton and Caledon. The synagogue is a Reform temple. When the building was purchased, many changes took place. New stained glass windows were installed on the east wall, and an ark was custom built to house the Torahs (scrolls). In 1998, land was purchased to the north of the building, to accommodate future growth of Har Tikvah Congregation of Brampton. In 1999, portables were moved onto the site to house the Hebrew school.